People usually want the freedom to go wherever they choose and to perform various kinds of activities. This is also the case for people with chronic conditions such as Multiple Sclerosis, spinal cord injury, etc. The difference is, either they can’t do it at all, or it is extremely difficult for them to participate in normal activities. Using a manual wheelchair may solve this problem to a degree, but using one requires significant upper body strength. If you find yourself exhausted using a manual wheelchair, you should consider going for a power wheelchair. Will this option solve all your problems? Let’s see. A manual wheelchair is usually foldable and lightweight. It is more reliable, less expensive, transportable and keeps you fit. On the other hand a power wheelchair is less versatile in terms of weight and volume, but can be a great help for people who have weak arms (for example people that suffer from neurological disorders). 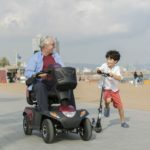 It allows you to move without effort, it may come with various power seating options (recline, tilt, stand), it is more expensive, it is battery operated and less reliable than a manual one. So, should you go for a power wheelchair? Since I suffer from PP Multiple Sclerosis, I had to choose a power wheelchair in order to manage my weak hands and fatigue, which gets unbearable in the hot climate I live in. The answer to the previous question therefore relies entirely on your individual needs. If you decide to opt for a power wheelchair, the first thing you need to do is consult an expert regarding your individual needs. You need to talk to your doctor, but you also need to talk to assistive technology experts, such as an occupational therapist. It may be helpful to get the opinions of people with similar conditions to yours. Searching through online resources may be helpful as well, but above all, visit retailers that are willing to let you test power wheelchairs, rather than trying to sell whatever they have in stock. A power wheelchair must be individually fitted, so make sure the retailer provides that service. 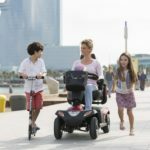 Moreover, you need to identify your mobility needs regarding home use, transport (you will probably need to change your car with a power wheelchair! ), or any other specific requirements you may have. The following resource may prove useful. The power wheelchair consists of a power base, a seat and the controls.These come in various configurations. The power base contains the drive wheels of the wheelchair. There are rear wheel, center wheel and front wheel chairs. Each configuration has advantages and disadvantages. Front wheel drive chairs are better for avoiding obstacles. Rear wheel drive chairs are more powerful. Mid wheel drive chairs have the smallest turning radius and are best suited for indoor use. A good resource for the pros and cons of each can be found here. The seat can be of numerous types and materials. It can also be equipped with various power options such as tilt, recline, elevate and even stand. Your assessment expert will help you choose an appropriate cushion and back. They will also help you decide which power options, if any, are necessary. Finally there are the controls. If you can’t use your hands, there are custom controls which can be operated with your head, chin, mouth, etc. Another important factor that will assist you with your choice, is who is going to pay for it. In many countries, such aids may be covered by Social Security, Insurance or various other grants. Carefully explore your options and make sure that you are eligible according to your provider’s criteria. Your chair is a vital investment and, in order to take care of it you might want to look up some accessories that can keep it new as the first day. To protect it and yourself from inclement weather, check out our post about wheelchair rain covers! No one power wheelchair will cover all your needs. Since purchasing an air powered wheelchair is a significant investment, you should select one that best addresses your current needs but also can be adjusted to your future needs. Consult, ask, examine, test. After all, you will spend most of your day on that chair, so be sure to make a wise choice!